Jerrel Hasselbaink was a no-name in Dutch football before going abroad. Two little Portuguese clubs were the base for the success and fame of Jimmy-Floyd Hasselbaink. He developed as a goalgetter each season at every club he was under contract. Starring at Boavista, clubs from England had Hasselbaink in the picture. He moved to England to play for Leeds United in 1997. Also his two seasons in the Premier League showed his nose for the goal. He earned his first international cap in May 1998 and was in the Worldcup selection of the Netherlands. Madrid giants Atletico Madrid contracted Hasselbaink in the 1999-2000 season. The top scorer netted 24 goals in one season and England was again showing their interests. Chelsea paid a record fee of 24 million euro for the Dutch striker. Jimmy-Floyd Hasselbaink played for five seasons at the London-based club and made an immediate impact. He scored 93 goals before changing clubs. His final Dutch cap, the 23rd, was when he played in Chelsea colours in 2002. Strong competition in the Dutch attack caused Hasselbaink playing a less important role than at his clubs he was under contract. From 2004 to 2006 he played at Middlesbrough and finding the goal was still not hard for the Dutch international. In the autumn of his career he joined Charlton after two successful seasons at Middlesbrough on a free transfer. 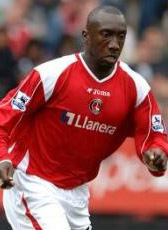 Charlton released striker Jimmy Floyd Hasselbaink already after one season at The Valley. He did not transfer his goalscoring form to Charlton and the 35-year-old scored only two goals in 25 Premiership appearances as the Addicks were relegated. The former Holland international last goal was in Charlton 3-1 home defeat at the hands of Boro in January 2007. In August 2007, he announced that he has signed a 1-year contract at Cardiff City, the Welsh club that plays in the English Championship. Although he featured in almost every match and scored seven times, his contract was not extended. At the age of 36 he decided to hang up his boots and made a start in his coaching career. He is currently releasing his coaching career. On 29 May 2013, Hasselbaink was announced as the new manager of Belgian second division club FC Antwerp. Since November 2014, he is the head coach of English League 2 outfit Burton Albion.